From the palynomorph- and leaf-bearing intervals of latest Cretaceous and early Paleocene age in North America and Eurasia, we now direct our quest for records of plants and the K-T boundary to lands formerly or currently in the equatorial region or the Southern Hemisphere. These lands are the remnants of Gondwana. The continents formed by the break-up of Gondwana were well separated by K-T boundary time. Africa, India, and South America had moved into tropical latitudes while Australia, New Zealand, Madagascar, and Antarctica remained at mid to high latitudes. Herngreen et al. (1996) stated that, in Late Cretaceous time, South America and most of Africa lay within the Palmae palynofloral province, which is characterized by assemblages with 10-50% pollen of the type produced by the Arecaceae (palms) and related species. That palms characterized the floras of the equatorial regions of these continents even in the Late Cretaceous is not surprising. Northern Africa was well north of the equator at 66 Ma and close to Europe and the Normapolles Province. As a result, northern Africa was in a transition zone between the Palmae and Normapolles provinces (Herngreen et al. 1996); see Figure 5.4. There was an increase in Normapolles pollen in northern Africa in the early Paleocene. 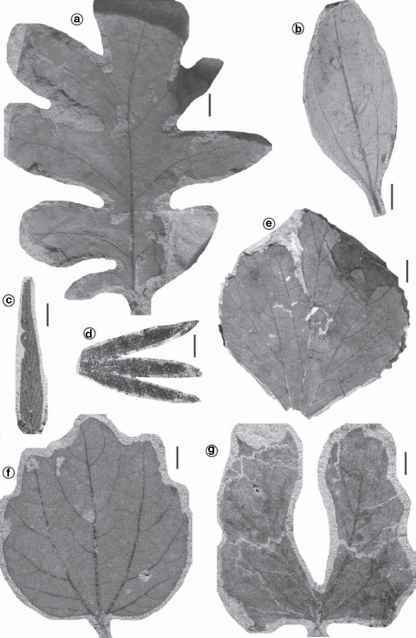 Contemporaneous palynofloral assemblages from India included elements of the Palmae Province admixed with some from both the Normapolles and Aquilapollenites provinces; there is no obvious paleogeographic explanation for this. Axelrod and Raven (1978) and Maley (1996) asserted that rainforests existed in Africa in Late Cretaceous time. Strong changes in palynofloras across the K-T boundary are not recorded for any of the equatorial regions, a pattern that led Hickey (1981) to argue that floral extinction was not global in extent. From our point of view, there has yet to be a well-studied and temporally constrained K-T boundary in the paleotropics, so this interpretation is premature. With the notable exception of New Zealand, the Southern Hemisphere has yielded very little data on the fossil record of plants across the K-T boundary. There is broad-scale palynostratigraphic data from Australia, but nothing that directly pertains to the K-T boundary, other than that it coincides with the boundary between two palynological biozones in rocks not exposed at the surface. There is some indirect information from Antarctica, discussed below. There is little known from South America, India, Madagascar, and Africa. The meager record of the K-T boundary is largely due to the apparent absence of nonmarine rocks of latest Cretaceous and early Paleocene age, although more may be learned with future exploration.